The roots of comparison and contrast are grounded in the nature of perception and of thought. Languages are rich in ways to compare and contrast things: to find similarities and differences in what we observe. 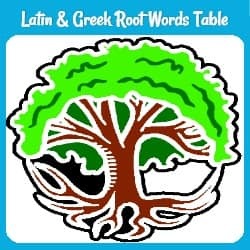 On this page you can learn the similarities and differences between English words for these ideas, and see the Latin roots they come from, starting with. lists of common words from each root. Then practice them by reading about the importance of comparisons, contrasts, and categories in our mental processes and in literature. Finally, match words and their meanings. dissemble, v.- to pretend to think or feel differently than you really do. Differre-- to set apart (carry away from) (from dis + ferre- to carry. See dis in List of Prefixes or ferre in 50 Word Roots from Latin for more. ): differ, difference, different, differentiate, differently. Distinguere- to separate between: distinct, distinction, distinctive, distinctively, indistinct (all from the past participle), distinguish, distinguished. Comparare- to liken, place together, or match (from com + parare- to provide, make ready, put in order-- also the root of prepare, repair, and separate. ): comparable, compare, comparison. Contrastare- to stand out against (or withstand, struggle against) from com + stare- to stand): contrast (noun or verb), contrasting. In English, we use compare to discuss similarities: the ways in which something resembles something else. We use contrast when we want to highlight the differences between two things. So a common essay assignment is to “Compare and Contrast” two writers or books, ideas, systems, or proposals. Such an essay looks at both similarities and differences, and may also evaluate or judge which is best. So many traits in different animals or different natural processes resemble each other. Scientists say that these traits or processes evolved to meet similar needs or fill similar niches, and that makes sense. But the resemblances go beyond just living things that could have evolved in similar ways. Even the stars and planets, the workings of matter and energy, show wonderful similarities of pattern. To me, it suggests that all were designed by the same Mind. 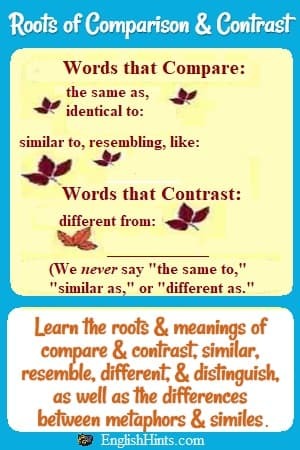 Similarities (as well as differences) enable us to categorize things: to organize them into related types or classes. For example, in biology we distinguish first between living and non-living things, then among the living between micro-organisms, plants, and animals. Among animals we distinguish between those with and without a backbone, and among vertebrates (animals with a backbone) between fishes, reptiles, amphibians, birds, and mammals, based on their structures, methods of reproduction, etc. Each new division contains creatures more and more closely related, until each scientific name (genus and species) includes only close relatives. 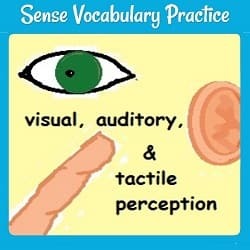 Our senses are designed to focus on differences. If you show someone a large white sheet of paper with a small black circle on it and ask what they see, they will probably say ‘a black circle.’ In fact, the bulk (larger part) of what they see is empty white paper, but they notice the one thing that’s different. This is actually a survival mechanism-- the ability to see a small movement that’s different than the wind blowing all the bushes around. That different movement could be something we could catch and eat-- or something that could catch and eat us. So our brains are able to perceive and focus on even small differences from what’s normal. Maybe that is why Latin and English (as well as other languages, I’m sure) have so many words for contrasts and distinctions-- for talking about what’s unusual or different. Like comparisons (seeing ways that different things are also similar), they are a basic part of our mental processing. Many of these words are close synonyms. For example, ‘to distinguish’ and ‘to differentiate’ can both mean to recognize the difference between one related thing and another; to tell them apart. Much of communication involves comparing something known to something unknown. We have words for several kinds of comparisons. Metaphors, similes, and sometimes parables are frequent in literature (as well as ordinary speech) for the vivid pictures they give us. Metaphors are implied comparisons. They say something IS something else, but we understand them as comparisons rather than statements of fact. “His smile is the sun, lighting my life” is a metaphor. Parables are stories that use familiar experiences to illustrate abstract or hard-to-understand ideas. Analogies (from the Greek word for proportion, adopted into Latin, and via French to English) also compare things to show their similarities, but they are more educational than literary. Note that the analogy can take the form of a metaphor or a simile. It can also take a mathematical form, its original use: ‘A is to B as C is to D,’ or ‘A tree is to a forest as a person is to a _________ [crowd].’ Analogies have been popular in some vocabulary tests, with one of the terms left blank. Secondary meanings of words are often metaphorical: we talk about the ‘wings’ of a plane, that are not feathered or moving like bird wings, but do enable the plane to fly. Some common metaphors include the ‘seasons’ of life (or the dawn, noon, and sunset of life, for childhood, young adulthood, and old age), using drugs as a crutch (a support for someone who can’t stand on their own), or ‘go for the gold’ (compete to win the first prize-- the gold medal). More English roots-- from Latin verbs of motion: attract (pull towards), retract (pull back), and tractor from the Latin root meaning 'pull;' compel, compulsive, expel, expulsion, propel, repel, and repulsive from the root for 'drive' and'driven'-- and more. Do you know the difference between intact & intangible, or sensitive & sensible? Find out-- and practice English sense vocabulary from Latin roots. Find the pages to study or practice over 100 root words on EnglishHints. This reference table gives meanings, examples, & links.